The WONDER WHEEL stands out as unique in the history of the modern pleasure wheel. Invented by Charles Hermann and built in 1918-1920 by the Eccentric Ferris Wheel Company using 100% Bethlehem Steel forged right on the premises, the Wheel opened on Memorial Day in 1920. The WONDER WHEEL was initially called the "Dip-the-Dip" by its inventor, who promised to combine the thrill of a scenic railway, Ferris wheel and Chute-the-Chutes. An article in Science and Invention described the new ride as a "real thrill like you have probably never had before—at least not at this great height!" Standing 150 feet tall -- the equivalent of a 15-story building -- and weighing 200 tons, the WONDER WHEEL has 24 cars, of which 16 are swinging and 8 are stationary. The swinging cars slide on a serpentine track towards the hub of the Wheel, and as the Wheel turns they slide towards the circumference. Each car holds 6 people for a total ride capacity of 144. 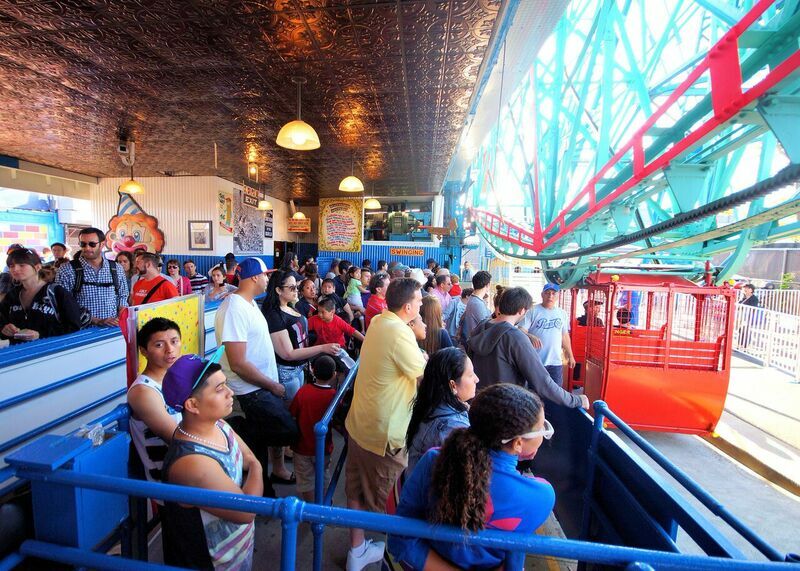 The WONDER WHEEL has maintained a perfect safety record for its entire history. The 18 original co-owners of the Wheel worked as construction men to insure quality throughout the building process. Each year, the entire 400,000 lb. ride is overhauled and painted to protect it from the elements of weather, wear, and tear. On June 7, 1983, Denos D. Vourderis bought the WONDER WHEEL from Fred Garms, whose father Herman was its first owner-operator, and it became DENO's WONDER WHEEL. The Vourderis family went to work restoring the Wheel to pristine condition and made it the centerpiece of DENO'S WONDER WHEEL PARK. One of the oldest, most cherished rides in Coney Island, DENO'S WONDER WHEEL was designated an official New York City landmark by the City's Landmarks Preservation Commission in 1989. Over 35 million rides have been given since it was built. The world-famous WONDER WHEEL was the inspiration for full-size replicas in Disney's California Adventure and Dreamland in Yokohama, Japan. The only stoppage in the history of the WONDER WHEEL was on July 13, 1977, during the Great NYC Blackout – when the entire northeast lost electrical power. Riders on the WONDER WHEEL were brought down safely because the owners hand cranked the wheel.